As we said in our last update, we have fallen for this small island and are still here - but we are doing some work on the boat now as well as having fun. We did mountain bike to the village at the end of the island last week - it was great fun cycling on the rough roads - just a few steep hills. The end of the week was all very social with an art show put on by the boat kids, several get togethers on other boats and we had Paul and Liz from Amaranth over for dinner. Far too much drinking going on - but great fun! 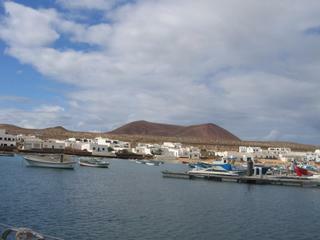 We took the ferry to Lanzarote on Tuesday to drop the sail of to be repaired and pick up some boat bits and pieces. We took the bus (yes public transport again!) to Arrecife. It was lovely as we went right across the island and into lots of small towns. We managed to get all the things we needed, bumped into some of our friends from Graciosa and went to a local place for fab lunch before heading back to our lovely island. Yesterday Andrew replaced the fuel filler and breather hoses while I made a start sanding the main hatch, which desperately needs varnishing. Today we have been re-fueling and filling the water tanks - a job that took all morning trying to arrange and get a slot and then transfer to the tanks. Simple things can take forever in paradise. We have decided to turn the fridge off today as it is using too much electricity - so using up the last of the ice in lunch time gin & tonics. I have lost Andrew for the afternoon as he’s been given a book on boat mechanics and electronics which he is engrossed in!!! After over a month of incommunicado we’re back again! 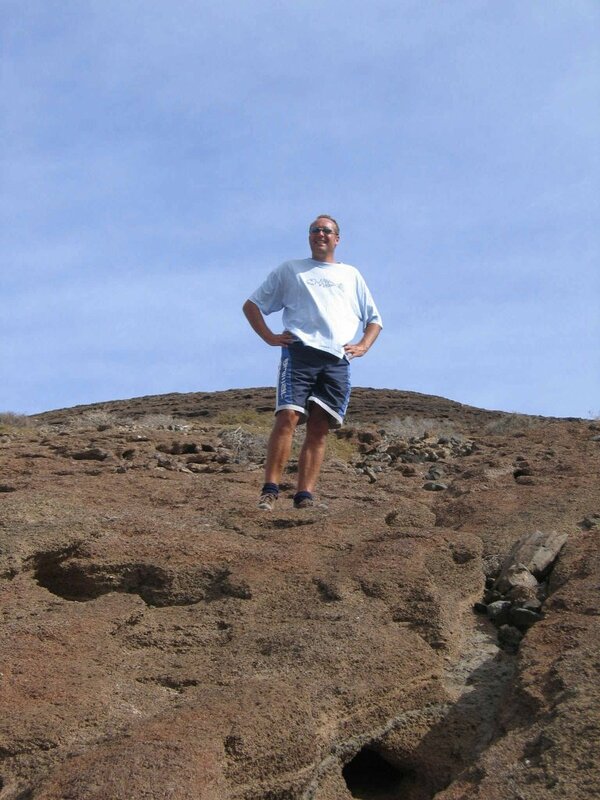 As promised update from Isla Graciosa. Since we last wrote we spent a few more days in Gibraltar - walked up the rock, saw some apes, explored some tunnels and stocked up on heinz baked beans, cheddar and gin (four quid a litre)before taking the step through the dreaded Gibraltar straight and out of the ‘comfort’ of the med. The sail through the straight was the most exhilarating yet - we had 30 knots of wind behind us, a very small sail and went very fast. Carolyn helmed most of the 20 miles and ended up with a blister she held the wheel so tight. 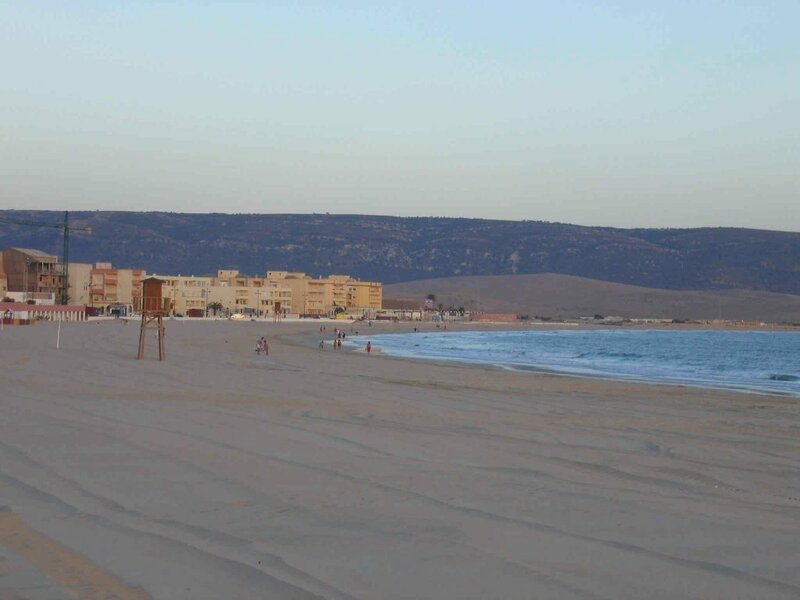 The weather was not right for us to head down towards the Canaries as we’d planned so we turned right a tucked into the fabulous fishing port of Barbate - here we discovered real Spain. The marina was all set to host the battle of Trafalgar celebrations a short while after so the only allowed us to stay a few very cheap nights - but we managed to extend it as the weather was so awful no one could get in or out of the marina. 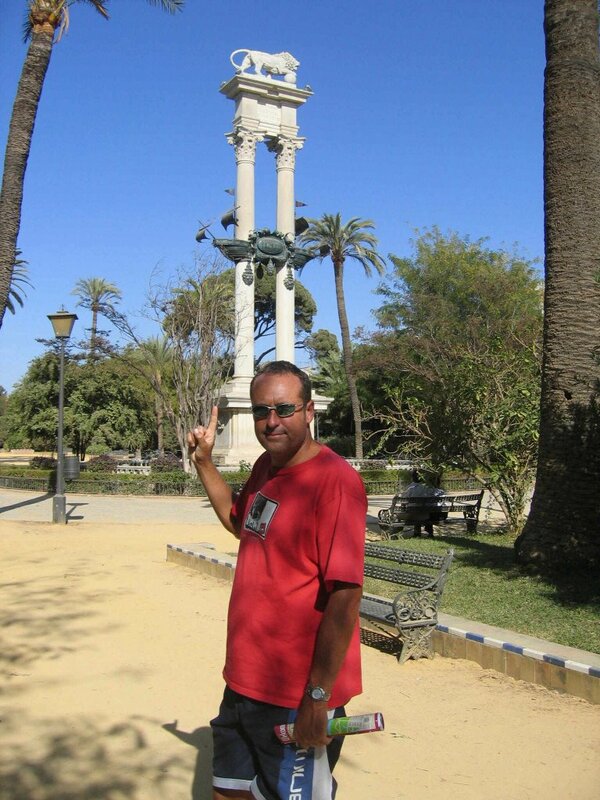 We used the time and took the bus to nearby Cadiz and went exploring for the day. When we came to leave instead we decided to take the train to Seville, so nipped into an internet café and booked a hotel then jumped on the train. We spent two nights in Seville. Everyone should go to Seville, it is the most beautiful city - we absolutely loved it. 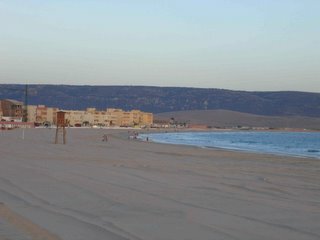 We finally said goodbye to Barbate on 13 October to make the trip down the coast of Morocco to the Canaries. 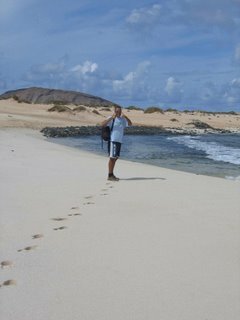 101 hours 15 mins later we arrived in Isla Graciosa just off Lanzarote. The crossing went really well, we had two days of fabulous sailing, two days of calm when we motored and one day of wind in the wrong direction. 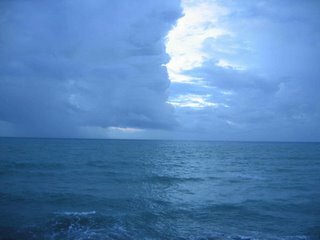 We experienced a crazy front on the last night, but luckily saw it coming a shortened sail sufficiently but it was still pretty scary when the wind does a turn of 180 degrees in 5 mins at 30 knots. One of the reasons we didn’t have much sail up was because earlier that evening we blew out a seam in the top of the mainsail - an expensive evening! On the way we saw loads of dolphins, some whales, turtles, had amazing sunsets and the biggest brightest moon every night, we read loads and generally had a great time. I’m going to apologise upfront as I’m going to go rambling on forever about Isla Graciosa - but to us this really is what our trip is all about - we may not ever leave! We arrived in Caleta del Sebo on Monday and feel like it’s our new home. The marina is full of international liveaboards - we’ve met Canadian’s, Australians, French, American, German, Norwegian, Swiss and a few Brits since we arrived. The marina has no facilities but cost just 5 euros a night (average we paid in the med was over 30). There is no traffic, the roads are made of sand, there is a couple of fab supermarkets, a few restaurants, amazing beaches, fantastic scenery, volcanoes and an amazingly an internet café - what more do you need?? The people we’ve met since we got here are great, we’ve been doing drinks, sharing boats bits and computer software. I went to pilates on the beach the other morning with a group of the girls. We went hiking the day after we arrived and walked over two of the volcanoes and across to the other side of the island - we found the most unspoilt beaches you can ever imagine. We had lunch on a beach about a mile long all to ourselves. Last night we took our kayak to Lanzarote - only about half a mile across the channel but quite hard going - but the sunset was worth it. Today Andrew is in the bilge again doing jobs- even in paradise there is no let up! But we have been lent some mountain bikes so hope to cycle to a little fishing village just up the coast later on. Will sign off for now - hope we’ve not made you too jealous - but this really is the life!! Luckily we were safely tucked up in the marina taking this picture from the sea wall. This was a result of Hurricane Vince that so many people we have since met got caught up in. Looks more like Hawaii but this is the town beach at the most real Spanish town we visited - wow! We had the most amazing trip down after all my worrying, we motored for the first day and night but then had lovely gentle winds in just the right direction and the sun came out and it was gorgeous being on passage away from land. We saw so many dolphins it just got to the point that unless they came to play we didn’t bother mentioning them but on the last night it was really dark and we had the most incredible phosphorescence that when the dolphins came to play they appeared as a streak of light approaching the boat and then looked like they had headlights on - unbelievable! 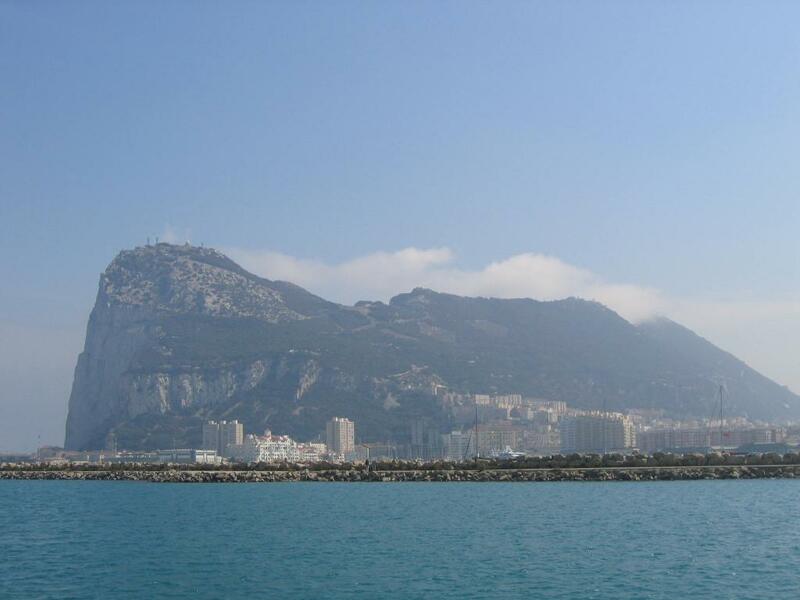 As we got near to Gibraltar the fog came right down and it was really errie, luckly Andrew had been getting really used to the radar on the way down, which we could not have done without. There was so many ships going in all directions - v scary indeed. We finally made it into Gib but no marina berths were to be found so we anchored off for the first night but managed to sneak a place the next night. Gib is v strange as all squaddies and sailors but the licor is v cheap and the morrisons supermarket is fantastic. We’ve stocked up and Andrew has done lots of engine jobs. Hopefully we are gonna go and do some tourist things tomorrow. We hope to set off for the Canaries towards the end of the week but will see how weather goes. Sorry we have not been able to reply to all your emails but web access has not been as easy as we’d hoped so far and when we get online we usually have only a few minutes but we really appreciate hearing from you.